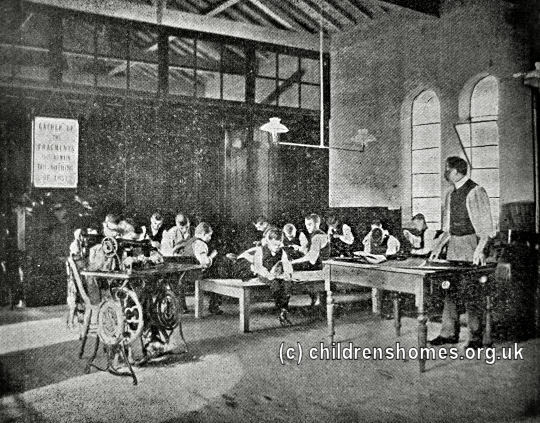 By 1870, the establishment comprised an Industrial Home (sometimes referred as a reformatory) for 50 to 60 boys, together with a Ragged School where each day elementary education was given each day to between 300 and 400 children from the densely crowded neighbourhood. 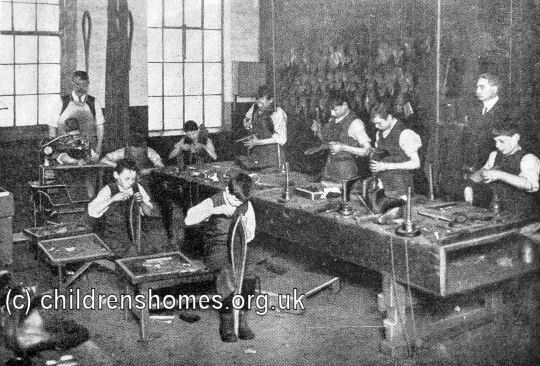 Boys in the Industrial Home, who were aged from 10 to 16, were given training in trades such as shoe-making and tailoring. They also carried out wood-chopping, with the firewood being sold locally. In 1884, the home accommodated up to 100 'destitute and unmanageable, but not convicted, boys, and those in danger of falling into crime'. A payment of five to six shillings a week was required for each boy's maintenance. On September 3rd, 1885, the home was seriously damaged by a fire but none of the boys was injured. One of the inmates, Frederick William Dunkley, aged 11, later admitted setting fire to the wood-shed beneath the dormitory. In 1901, the home was taken over by the Waifs and Strays Society and renamed it the Islington Technical Home. It was run largely along its existing lines, now housing 60 boys aged from 13 to 16. Shoe-making and tailoring were still taught, along with carpentry, but wood-chopping was dropped. The weekly laundry was another task performed by the boys. It would seem in these days a most inappropriate locality upon which to settle for a Home; but, after all, its position in the very heart of crowded work-a-day London has its distinct use, for it serves as a "receiving house" or emergency refuge for those lads who may be picked up, as often happens, in a moment, who must not be left where they are, and yet who, for several reasons, cannot be despatched at once to a Home in the country. For such a boy, for instance, as "The Captain," mentioned elsewhere, the Islington Home formed a most useful half-way house for a few days, between his old unlicensed life and the permanent new quarters which he is now finding such a contrast to it. Islington, again, is most handy for taking in boys from other Homes who need hospital treatment, or, at any rate, examination and advice such as is unattainable in country districts. The fact must not be lost sight of that though the "bill of health" in our Homes is wonderfully clean, yet the past lives and surroundings of a great number of our cases have sown the seeds of a weakness and debility that need continual after-care, watchfulness. and professional treatment. With a special view to the needs of this class of case, a sick ward is, with no little trouble and expense, being built on to the Home. 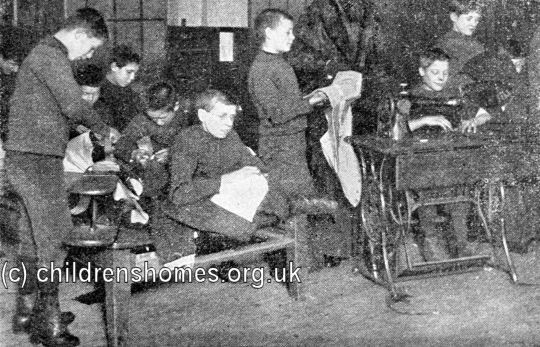 Beside these two classes constantly coming and going, the Islington Home regularly houses about forty boys, who, being all, or almost all, past school age, are being trained in industrial work of different kinds. 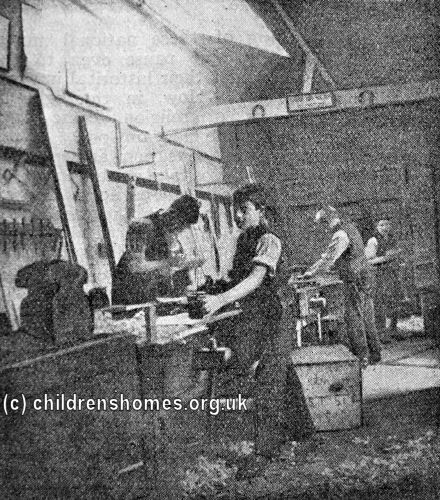 There are three "shops," each with a teacher, in which are taught tailoring, shoemaking, and carpentering; and even while lads are learning these most useful arts, their efforts are an actual source of profit to the Society; they do the shoe-mending for other Homes (and a pretty problem to one not an expert some of those shoes — on their last legs — appear to be! 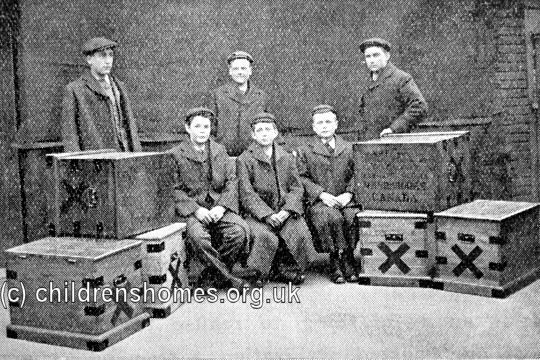 ); they make boxes for emigrant outfits, cupboards, benches, and other furniture for their own Home; and, as for clothes — what is there they cannot make? The cut may not always be that of a West End establishment, but the material is excellent and the workmanship sound. That their work is appreciated outside, the following little anecdote will show. One of the Society's secretaries from the country paid a visit to the Home, and was so pleased with what he saw in the tailors' shop that lie forthwith ordered a suit of clothes, for which he was measured. He told them, at the same time, not to hurry if they had more important orders. This happened more than two years ago, and when he paid another visit to Islington a few weeks since, he found that through a continued press of work, his suit was not yet in hand ; and now it is thought that probably new measurements will have to be taken, at any rate, with regard to the circumference of the waistcoat! The boys also practise on one another the most useful art of hair-cutting; a demand on the part of a visitor for the execution of an order in this department would doubtless receive more prompt attention than is always possible in the tailors' shop. Needless to say, no painter from outside is wanted; all such work in dining-room, work-rooms, and dormitories, is of course carried out by the boys themselves; and whereas in other Homes all wall decorations, such as pictures, should be framed before presented, Islington is proud to do at odd moments its own framing and glazing. It is undoubtedly a drawback that no public recreation ground or playing-fields are within reasonable distance; yet the boys do not come off badly for exercise. Their playground, or yard — for it is scarcely more — is asphalted, and the only cricket and football which are possible are of the mildest kind, and must be played, owing to numerous unprotected windows surrounding it, with a ball composed of soft scraps from the tailor's shop. But it forms, particularly in winter time, an excellent rink for roller skating (N.B. there are forty boys, and considerably less than one skate apiece, and Gamage's shop is in Holborn!). 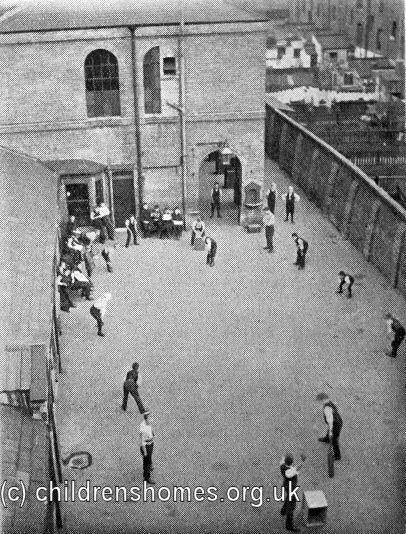 Then they have a good gymnasium, where, it should be mentioned with gratitude, a most excellent friend, a young hard-worked city clerk, has for years devoted himself one unfailing evening a week to putting the boys into the way of making the most of their gymnastic appliances; this same friend has also provided the boys, through his friends, with the necessary rubber shoes. On this point of exercise, it is also to be noted that the Master sends the lads out continually upon errands, and on half-holidays even trusts them out unescorted to view "the sights of London." It speaks excellently, does it not, for his judgment and for their honour that his confidence in them is never abused; it is no great matter perhaps, yet a satisfactory proof of moral training well instilled and well accepted, that a big sack of apples can travel in charge of two boys "unsampled" from one end of London to the other! On Sunday all the boys go twice to church, and there are many, of course, who are confirmed; an afternoon class is also kindly undertaken by students from the St. John's College, Highbury. 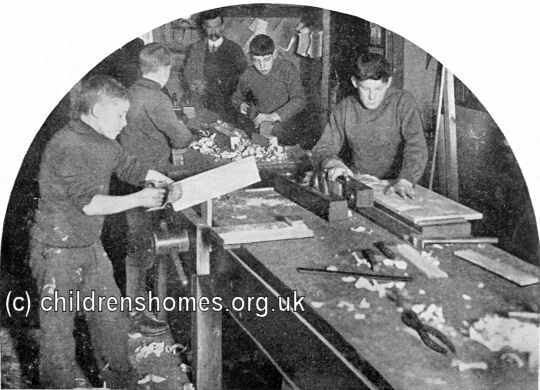 Many of the children in the Society's care were emigrated to Canada and the Islington played an important role in giving boys practical skills for their new lives. 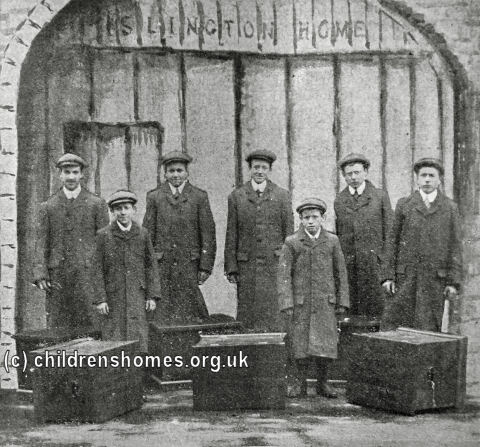 The picture below shows a party of Islington home boys preparing to leave for Canada on June 7th, 1907. Another emigration party set out on June 29th, 1911. The boys were taken on a summer holiday each year, usually for two weeks. In 1907, they visited Cliffe-at-Hoo in Kent. 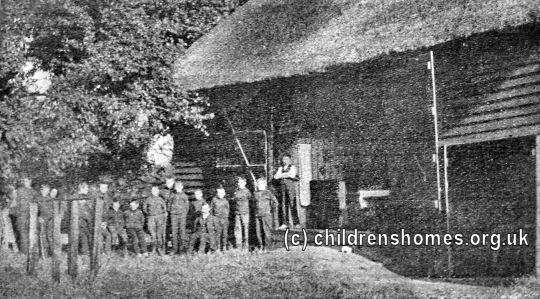 As well as its ongoing residents, the home acted as an emergency hostel for boys who could not be found accommodation elsewhere or who needed urgent medical care. 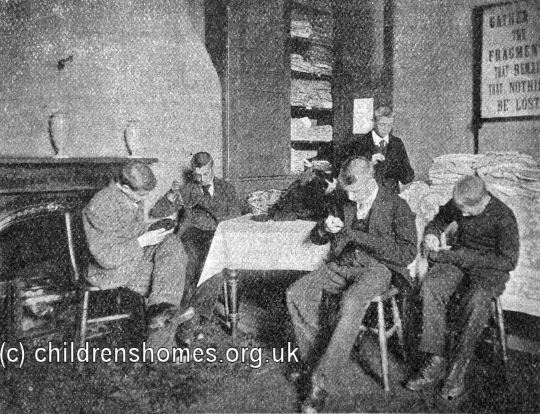 In 1912, the minimum age of the boys admitted to the home was lowered to 8 years. 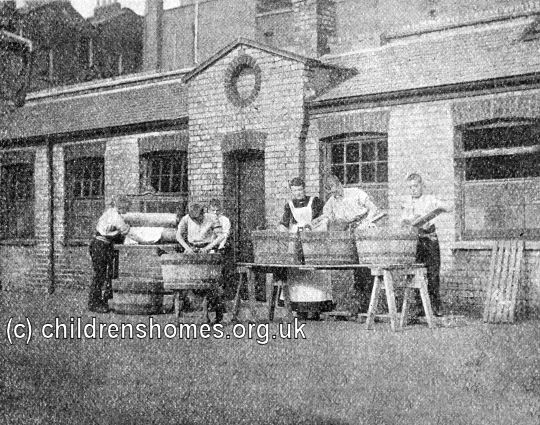 The Islington home was closed in 1913 and thirty of its residents were transferred to a new home at Wellingborough. The Copenhagen Street premises no longer exist.